Once incoming solar energy reaches Earth's atmosphere, what parts of the Earth system absorb and hold the energy, warming the planet? In this lab, you will explore some of the elements that absorb solar energy, the greenhouse gases (GHG). These gases include: carbon dioxide, methane, nitrous oxide, and water vapor. You will see that each greenhouse gas responds differently to electromagnetic radiation. This is an important asset of our current atmospheric composition. It allows some forms of solar radiation to pass through the "atmospheric window," to the planet's surface and also back out to space, while retaining other wavelengths of energy to warm the atmosphere and Earth's surface. In this lab, you will further your understanding of the Earth's energy balance that you investigated in the previous labs. 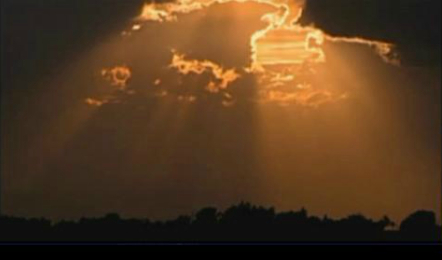 First, click the link How does the sun's energy get into the climate system? to access the narrated video, describing the importance of the greenhouse effect in making the planet habitable, or able to support life. After viewing the video, discuss the question listed below with your classmates. How do greenhouse gases impact life on Earth? Next, learn more about greenhouse gases and how they contribute to global warming by viewing a short animated presentation and reading a background article linked below. Click the links below to read the article and view the animation. Once you have finished reading, answer the Checking In questions below. Note: on the third to last slide in this presentation several words are omitted; see if you can add the needed words to complete the sentence. "These gases absorb the infrared radiation emitted by the Earth and re-radiate the energy as heat back towards the Earth, causing a warming known as ______ ." The NASA article, A blanket around the Earth gives detailed information about the greenhouse gases and explains the expanded greenhouse effect. What words were omitted from the greenhouse effect animation? 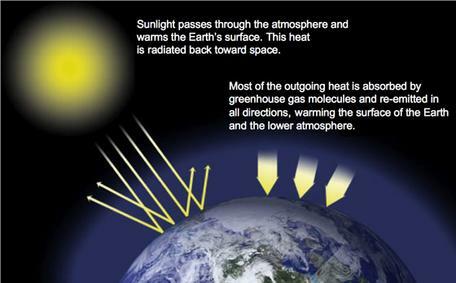 The phrase should read "These gases absorb the infrared radiation emitted by the Earth and re-radiate the energy as heat back towards the Earth, causing a warming known as the greenhouse effect." Select the greenhouse gases described in the article: 'A blanket around the Earth' from the list below. When you have made your selections, click the Check Answers button. Nitrogen Nitrogen is not a greenhouse gas. It is inert. Oxygen Oxygen, while an important gas for life on Earth, is not a greenhouse gas. Which of the greenhouse gases (GHG) is most abundant in the atmosphere? Water Vapor is the most abundant GHG and plays an important role in feedback mechanisms that either amplify (speed up) or dampen (slow down) climate change. However it is very short-lived in the atmosphere. Once it reaches a certain concentration, it quickly condenses into clouds and precipitates back out of the atmosphere. Select the man-made, or anthropogenic greenhouse gases from the list below. Water Vapor Water vapor is naturally occurring. However, it is an important greenhouse gas. Its increased concentrations are a result of increased temperatures. Chlorofluorocarbons (CFCs) CFCs are entirely man-made. They were once commonly used in refrigerants, and are now regulated. Carbon Dioxide Carbon Dioxide is naturally occurring, but humans have increased the concentrations of the gas in the atmosphere. Methane Methane is a naturally occurring GHG. Its sources include rotting vegetation. Nitrous Oxide Nitrous Oxide is both naturally occurring and a man-made gas. It is a byproduct of the production of fertilizer. Which of the long-lived greenhouse gases is the most important ? Methane is a more potent greenhouse gas, but Carbon Dioxide lasts longer in the atmosphere and therefore it is more important. Now that you have some background information about the factors that control the greenhouse effect, you are ready to try an experiment! Begin by reading the instructions and information in the flash interactive, shown below. To view this interactive on an iPad, use this link to download/open the free TERC EarthLabs App. Once you are second screen of the interactive, there are three sliders to control the concentrations of greenhouse gases in the atmosphere. Move them and observe the changes that occur in the graphic. Note both the changes in the temperature and the color of the atmosphere. After you have explored the sliders impact on temperature, use the three radio buttons to view Greenhouse Gas concentrations and average Earth surface temperatures; record your answers to the Stop and Think questions, below. For more information about the data used in the interactive click the info button at the top of the screen, or view the information shown below. A long-term record of the concentrations of these gases can be seen in the graphic below. 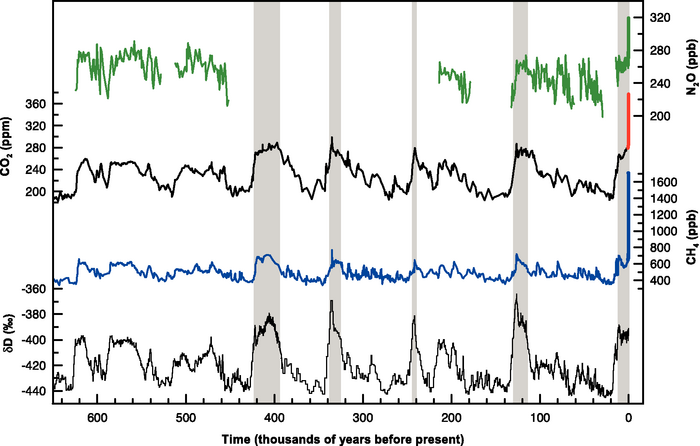 Note the dramatic rise in the all three of the greenhouse gas concentrations in the most recent time period. Begin with the Year button set to Today. Note the average global (land and ocean) temperature, shown in the thermometer above the graphic. Record the concentration of the three primary greenhouse gases, CO2, CH4, and N2O in the table on your answer sheet. Note that the N2O and CH4 concentrations are in parts per billion. In other words, there is very little of these two gases in the atmosphere as compared to CO2. Next, click the 1850 radio button to select the period around 1850. Note the global temperature as well as the composition of the atmosphere. Record the composition of the atmosphere in the table on your answer sheet. Next, click the 2100 radio button to select the period around 2100. Note the global temperature as well as the composition of the atmosphere. Record the composition of the atmosphere in the table on your answer sheet. 1. Complete the table below. Record the average global temperature and each of the greenhouse gas concentrations. Once you have a sense of these three atmospheric states, explore the variable GHG concentration slider. As you reduced the greenhouse gases to zero, what happened to the temperature of Earth? 2. Why are greenhouse gases (GHG) important to life on the planet? Both instrumental and satellite data show that the years between 2000 to 2010 were the warmest decade of the past 150 years, and 2014 was warmest year on record since 1880. In fact, 9 of the 10 warmest years on record have occured during the 21st century. (Source: NOAA State of the Climate 2014) What could be causing the heating of the planet? Which parts of the balance have changed? This NASA video, Piecing Together the Temperature Puzzle, (5:48 minutes) explains the scientific understanding of how various elements of the Earth-Sun system, including changes in the solar cycle, alterations in snow and cloud cover, and rising levels of heat-trapping gases, may be contributing to these new records. As you watch the video, consider how the individual changes in Earth's climate are like a series of puzzle pieces that, when connected, begin to form a recognizable pattern. As you watch this video, you will also gain an appreciation for the contribution that NASA satellites have provided towards the solving of the global climate puzzle. Preview the following discussion questions before watching the video. Use the controller to review sections of the video as needed. Why do we study the planet as one interconnected system? How do we know that the Earth's climate is changing, and what is the role of greenhouse gases in that change? Another, more complex, greenhouse gas interactive can be accessed here: Greenhouse gas interactive. This JAVA applet has several layers of complexity and includes a visualization of molecular interactions with photons. Additional information about Greenhouse gases, their sources, and role in global warming can be found on this NOAA page. 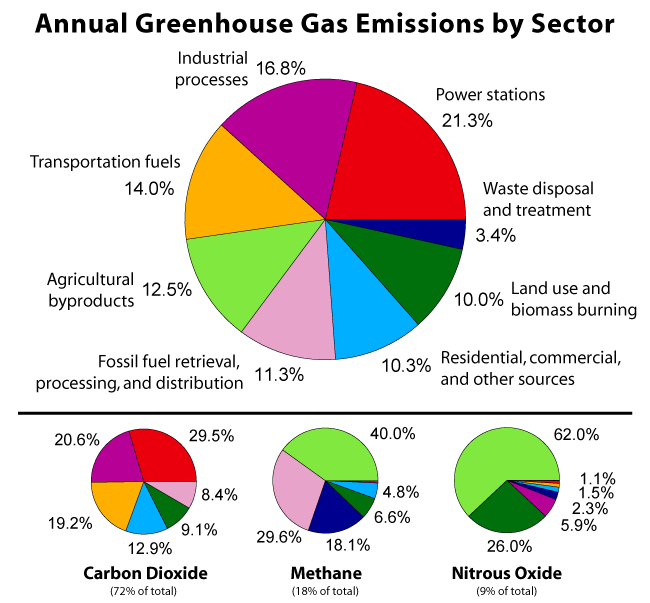 The following graphic shows the sources of the greenhouse gases by sector. An interesting exercise would be to research each sector and consider ways to reduce the emissions of these gases.